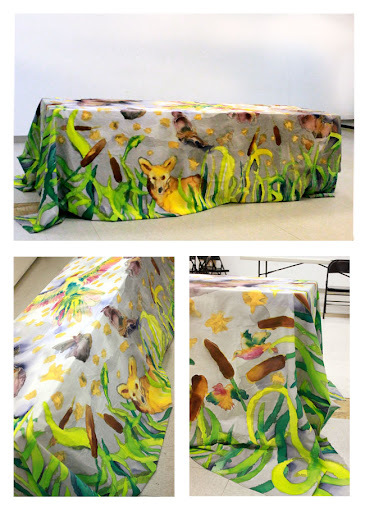 naomese - naomi bardoff's art blog: finished tablecloth! I finally finished painting and ironing my tablecloth! These pictures give an idea of what the tablecloth is like on a table, but unfortunately the table is the wrong size and the only good place I could find to take a picture was in a seminar room with tiles missing from the floor and black folding chairs all over the place, so it's not quite right. Later, when I've finished painting the walls of my space in UBS, I'll get some pictures of the tablecloth there! Looks great ! What's next? Love the picture of you painting the wall - so much energy! William Blake would thing it wonderful. And the table clothe is GREAT ! ! ! !